So finally everything is set up with macOS Mojave and we are excited to use all new functions added with this macOS version like Group FaceTime up to 32 People. The very first app that we launched was FaceTime. Unfortunately, FaceTime camera not working on Mac when we try to connect with our friend that was the awful situation for us. But then we found there are several people they are also facing errors like FaceTime ringing but not connecting, FaceTime not activating, FaceTime waiting for activation, etc. 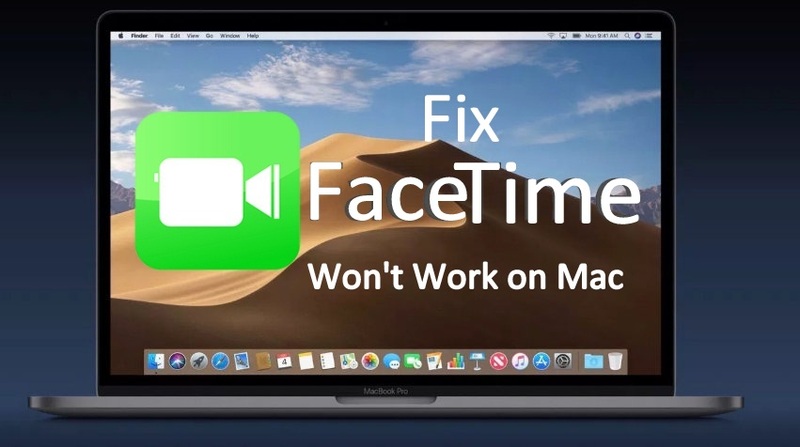 But don’t worry in this article we have collected and listed some of the possible and potential fixes which can fix FaceTime not working on macOS Mojave within minutes. We will start with a very basic solution which is to disable and then restarting the Mac and then again enabling the FaceTime. This will solve all the problems like FaceTime waiting for activation, FaceTime not working on macOS Mojave and more. Step #1: Go to “FaceTime” and then from the “Preferences”, disable “FaceTime”. FaceTime requires an efficient internet connection on both ends. If your internet connection is perfect, then make sure that your friend or family member also has a working internet connection. Make sure that your email address or phone number, which are registered in FaceTime is correct. The messaging and video calling applications require accurate date & time as per your time zone. If not, then definitely at the very first moment it will show error. FaceTime comes under that category so go and check the date and time of your Mac. Step #1: Click on “Apple” icon. Step #2: Open “System Preferences”. Step #3: Click on “Date & Time”. Step #4: Turn on “Set Automatically”. Step #5: Verify the time zone and city is correctly selected. So after trying all the solutions still the FaceTime is showing Waiting for activation error then lastly you should try to change the DNS setting of the Mac, it might work for you. Step #3: Choose the “Wi-Fi” network and tap “Advanced”. Step #5: Click on (+) and add “Google DNS”. Step #6: Enter 8.8.4.4 and 8.8.8.8 and “Apply” changes. Note: Certain feature may not work in macOS Mojave Public Beta and macOS Mojave Developer beta, in this case, you should submit a report to Apple via Feedback App. hope it will resolve your FaceTime issue in next latest mac Mojave Update. Thanks for Reading. Enjoy macOS Mojave FaceTime and get Group video call chat experience like you never get before!